These job search tips will help you improve what you’re doing during your hunt for a new job. Because we all could use a little help with our job search. I love finding and sharing articles with actionable tips to help your job search. From networking to interviewing and everything in between, these articles were carefully curated to deliver results! Based on a recent study, these are the top 5 mistakes executives make when it comes to networking. Don’t wait, start fixing these today! If an employer is looking for someone with the skills and qualifications to fill a job, will your profile show up? It’s time you optimize your LinkedIn profile. Use these steps to improve when and how you show up when employers and recruiters search LinkedIn. Five Ways to Shine in a Bad Interview! Not everyone is trained in interviewing potential employees. Don’t let a bad interview ruin your chances. Follow some of these ideas to turn a bad interview around. Whether you use a flowchart to help do your job better or feature one on your LinkedIn profile as a sample of your work…visuals tell powerful stories! Are you showing your work to the world? Yes, this is my post. I’m fairly certain you will find a website or two listed that will improve or enhance your job search. Everyone can use a little help being more productive. The thing is, one method won’t work for everyone. That’s why this massive list of options is great. I hope you find one that works for you! Mark and I have had several conversations over the years! We take a ride in the time machine in this one! Job search has come a long way! And I’m sure we’ll see more advancements in the future! During this interview with Virginia, we talk about common problems job seekers face…and provide solutions! 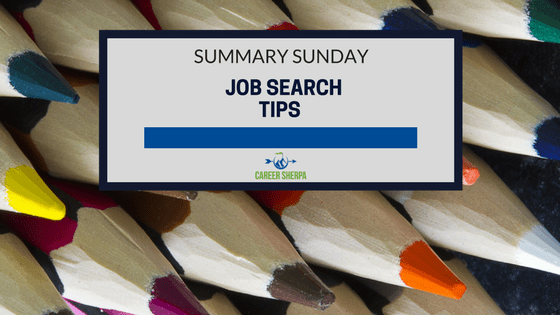 The post Summary Sunday: Job Search Tips appeared first on Career Sherpa . Next Next post: What’s the Best LinkedIn Headline For An MBA Candidate? Build Yourself Create a free website or blog at WordPress.com.